Anthony Marshall was sentenced to one to three years in prison but is free while he appeals. 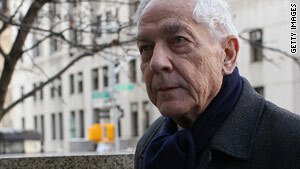 (CNN) -- A holdout juror says she feared for her safety when she "folded" under pressure and voted to convict Anthony Marshall of charges that he stole from his mother, wealthy philanthropist Brooke Astor. Court documents filed Monday in Manhattan Supreme Court paint a dramatic picture of jury-room intrigue at the high-profile trial that painted a troubling portrait of the socialite's life as she succumbed to Alzheimer's disease in her final years. Astor died in 2007 at age 105. Marshall, Astor's 85-year-old son, was convicted in October of conspiracy to defraud his mother, larceny and other offenses and sentenced to one to three years in prison. He is free on bail while he appeals. The holdout juror, who favored acquittal, alleges that another juror intimidated her, cursed at her and flashed gang signs at her during the contentious third week of deliberations, according to court papers. Yvonne Fernandez, the juror accused in court affidavits of making the gang signs, denied it when reached at home by phone. "I don't even know gang signs," she said. Fernandez is a former technical director at In Session, which airs on CNN's sister network, TruTV. The holdout juror, identified in court papers as Judith DeMarco, told Marshall's defense that she became fearful when neither the judge nor anyone else on the jury would back her. Her requests to leave the jury were ignored, she told Marshall's defense investigator and attorneys. "The judge wasn't going to protect me," DeMarco told defense investigator Margaret Clemons, according to Clemons' affidavit. "At the end I'm ashamed I couldn't stand my ground. But I couldn't take it any longer. I couldn't take it. I don't want to see anyone innocent go away, but I had to do what I had to do," Clemons' affidavit quoted DeMarco as saying. DeMarco declined to sign her own affidavit, saying she feared the publicity would disrupt her life, according to the court papers. A fellow holdout also gave in, telling DeMarco that the defendants were wealthy enough to appeal, DeMarco told Clemons, according to the affidavit. DeMarco said she felt awful after voting to convict Marshall and his estate lawyer, Francis X. Morrissey. She said she spent the next three days in her apartment, curled in a fetal position, according to the court papers. Meanwhile, according to court papers, the other jurors were e-mailing one another, allegedly orchestrating how they would tell their story to the media. Defense attorneys John Cuti, Thomas Puccio and John Cromartie are asking the court to toss out Marshall's conviction. They are requesting a March 4 hearing. Prosecutors said they were reviewing the matter and would have no further comment. The court papers also contained nearly 60 e-mail messages the defense alleges were exchanged by the other jurors. The jurors discussed how they should publicly portray their deliberations and put up a "united front." The defense says the judge at the trial failed to properly question jurors after receiving a note that a member of the jury felt threatened. The confrontation between DeMarco and Fernandez, who had become friends during the trial, occurred as the panel struggled with the most serious charge against Marshall: whether he stole by giving himself a $1 million raise for managing his mother's financial affairs, according to the legal papers. Fernandez acknowledged to CNN that she raised her voice at DeMarco, but only after DeMarco said the judge's instructions "didn't do it for her." The e-mails showed that following an interview with Vanity Fair, the jury forewoman said she "followed the script" that jurors had agreed upon and portrayed the confrontation as "a flare-up." The jurors also discussed whether to appear on the television show "20/20." One juror described the holdout, DeMarco, as "a drama queen" in an e-mail dated November 3. Another called her "a crazy old coot." CNN's Stephanie Chen contributed to this report.